Wombats City Hostel Vienna - The Lounge i Wien, Austria: Bestill nå! 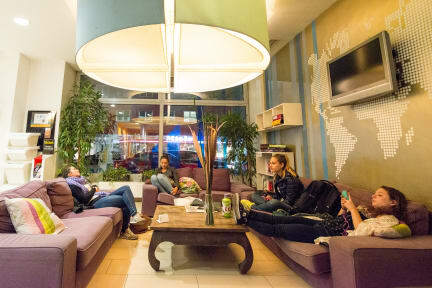 Oversatt av Wombats City Hostel Vienna - the Lounge ligger på Wiens viktigste handlegaten, og er "rett rundt hjørnet fra Westbahnhof, som er der flybussen stopper, og det er en veldig enkel metrostasjon rett eller en spasertur til sentrum", som ett Hostelworld gjest sa. Dette vandrerhjemmet har en høyt rost frokost samt en populær bar hvor det arrangeres fester regelmessig mens holde rommene stille. De er oftest hyllet på vår side for sine hjelpsomme, vennlige personale. Certainly the best choice if you are up for a state-of-the-art Hostel, cozy common areas, social vibe and friendly local staff. All our rooms come with comfy beds, private shower and toilet facilities. Rates include free bed sheets and towels and there's free lockers in every room. Our lounge is a giant comfort zone with all standards and extras you need to relax, get informed, communicate, socialize and chill. Our lively Wombar serves cheap drinks and food but is beneath sound-proof brick vaults in the basement, so no noise will keep you from having a good night's sleep. Cooking some dinner? There's free pasta, tea, coffee, spices and more in our guest kitchen. Please note that our rates don't include breakfast. An all-you-can-eat continental buffet brekkie is available each morning for an additional fee. You don't need to reserve breakfast; just come around to the reception in the morning if you're hungry. The five reasons why wombat's CITY Hostels became a destination by their own right is because we have the best cleanliness, the most amenities, the best social atmosphere, we're not dirt cheap and we're the hostel from travellers for travellers. Cleanliness is not something to take for granted in many other hostels, but we do take this seriously: we have won the 'cleanest hostel worldwide' award. Twice. We offer maximum security with smartcard access for the front door, the floors, the rooms and your locker. There's free Wi-Fi in the whole house as well as free travel guide books, free luggage storage and a free welcome drink. Other facilities include lend out notebooks and laundry. We also have loads and loads of free brochures about tours, sights, accommodation and other destinations in Europe, plus a free map of Vienna. Reception is open 24hrs and there's no curfew, no lockout and no stupid rules. We've travelled the world ourselves - so we know first-hand what you're doing and what you expect from us. We care for you and we care for your feedback. We make sure that you will feel safe and welcome here. When you've been on the road all day long, seeing sights and walking and walking, it's cool to have a nice scene at the hostel where you can have some beers, talk and make friends. This will make your stay a memorable one! Many traveller stayed quite a bit longer than primarily intended. You may find a cheaper place to crash in town, but none where you get more value for your money. Had a great stay at the wombat hotel. It was the first hostel we stayed at on our eurorail trip towards france and it was my first time staying in a 10 bed dorm. The best part of the stay was the atmosphere of the place. It was buzzing with young people, there was a euro 2016 game that you could participate in and something for everyone. They had a cool bar downstairs, a nice kitchen, a lounging area etc. A good overall experience. Oversatt av De fleste store vandrerhjem har skjegg moderne fasiliteter, men er blid og mangler i atmosfæren. For oss, Det er veldig viktig å bare ansette personale som vet hva et herberge egentlig er, bo i dem når de reiser seg og så vet fra egen erfaring hva gjestene forventer. Jeg tror vår hostel er ideell for alle som tror er for kjedelig for et sted å bo. Vi har nesten alle de fasiliteter du forventer fra et hotell, men en god hostel tilbyr så mye mer.